In some situations it may be desireable to define two Column Grid segments as the "same" grid number/letter. 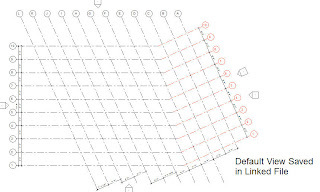 Revit however restricts each Column Grid" to a single segment and a unique number. A structural grid layout that simply changes direction but is the "same" grid as far as the team is concerned as pictured here. The above example shows the use of extra characters to make the second segment almost the same, 1 and '1, 2 and .2 and 3 and -3. These seem like reasonable solutions but sometimes they are met with either resistance or outright refusal. If you meet with outright refusal then you can consider this option. Create half of the "same" grids in a separate project file and then Import/Link the file into your project. These linked grids will be unique in their own file so you can re-use the numbers/letters that are already assigned in the real project. This approach isn't perfect as you may need to change the layout of the grid in specific views. 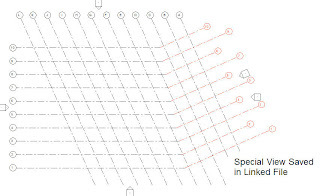 In order to manage these specific changes you need to create special views in the "angled grid" project file that provide the offset or individual adjustment needed. Then in the host project you can override the visibility/graphics settings to use this special view instead of the default setting. 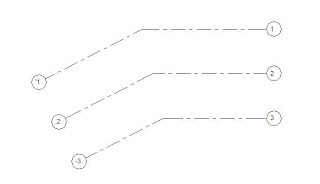 The above example displays the special view created and used when a unique situation is required. Link both files together so you can manage the appearance of the grids in either file more easily. Fwiw, the Copy/Monitor tool will not permit you to re-use the same grid numbers so it isn't an option.